This is a blog about the stories I find in my family history research. If you would like to collaborate or want information about the sources used, contact me by leaving a comment or by email. The origins of the Clark (my father's) family go back to at least the 1600's in Kent through Jane Beer who married John Clark, and the Tunbridge family are part of that line. My GGGGGG Grandparents, Thomas Tunbridge and Rebecca Cloke were born in the early 1700's. This was a time of harvest failures and diseases like influenza, smallpox, dysentery and typhus. 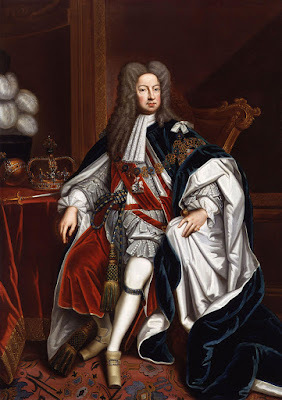 Queen Ann had died and the first Hanover king, King George 1st, was ruling England, he had come to the throne because George was Anne's closest living Protestant relative. King George I, c. 1714. Studio of Sir Godfrey Kneller. I have not found Rebecca Cloke's birth or baptism, but she was probably born in Alkham, Kent around the same time as Thomas Tunbridge. Thomas was christened on 13th February, 1715. 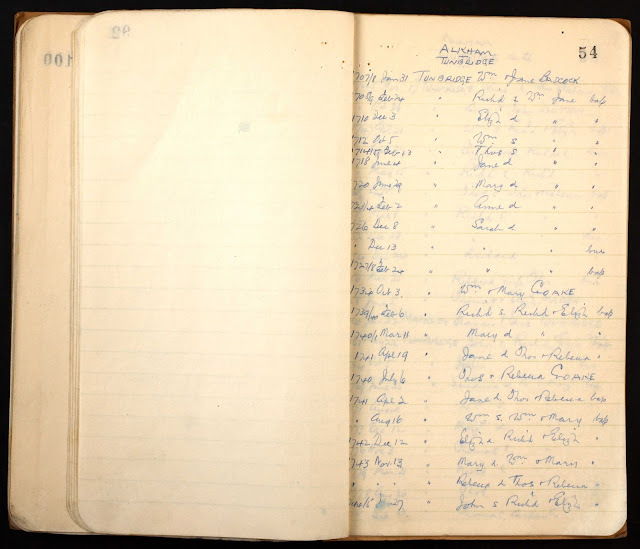 Once again the Tyler Index to Parish Registers is the source, as it is for their marraige in 1740 at the St Anthony the Matyr, Alkham; a church that was built in the 13th century. Tyler Index listing Baptism of Thomas Tunbridge, 1715. Tyler Index listing the marriage of Thomas and Rebecca. I have found only four children, Jane, Rebecca, Ann and Richard Tunbridge, however there may have been more. Rebecca died in March 1756, probably aged only around 42 years. Thomas lived until he was 83, and died in 1798. What was there life like I wonder? There are no hints as to what Thomas's profession was, but Rebecca's parents also came from Kent, so it is possible they went to the same church. 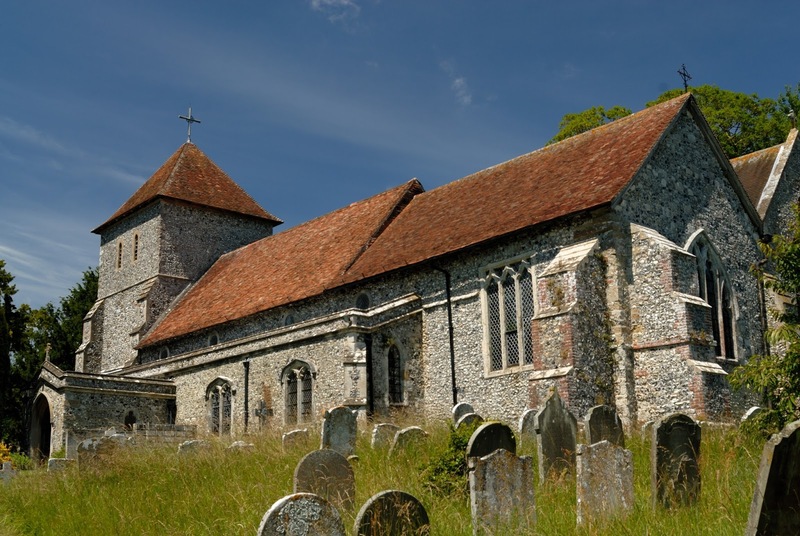 Alkham, where they lived is a village only 3 miles from Dover, and in those times life was centred around the church. Most of the population appears to have been agricultural labourers or tradesmen, possibly working for the manor house, and shopping would have been done at the local market. please contact me or comment below. I would be happy to collaborate with you. Thanks for your comment on Genealogy Boomerangs. All our comments are moderated and it should appear shortly. I hope you enjoyed the read. If you need help with your own Australian research, just email me at bk@hospitlpacks.com.au.